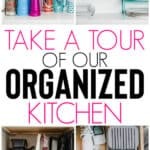 Today I am so excited to share a tour of our farmhouse kitchen with you and how we keep our kitchen organized and clean! I am a firm believer that organizing is a process, never a one time task. And that has definitely been the case with our kitchen. We moved into this home as newlyweds. And as with most newlyweds comes a lot of stuff and a lot of gifts that you don’t actually use. I have yet to use all of those place settings, and slowly over the years of decluttering, they have made there way out of my cabinets and into storage boxes. 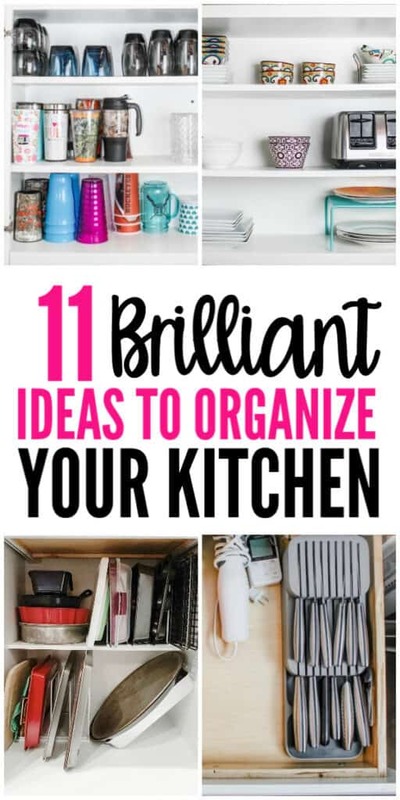 As well as all the clutter that once filled my kitchen cabinets. So let’s begin this tour of our organized kitchen and how we keep it that way! 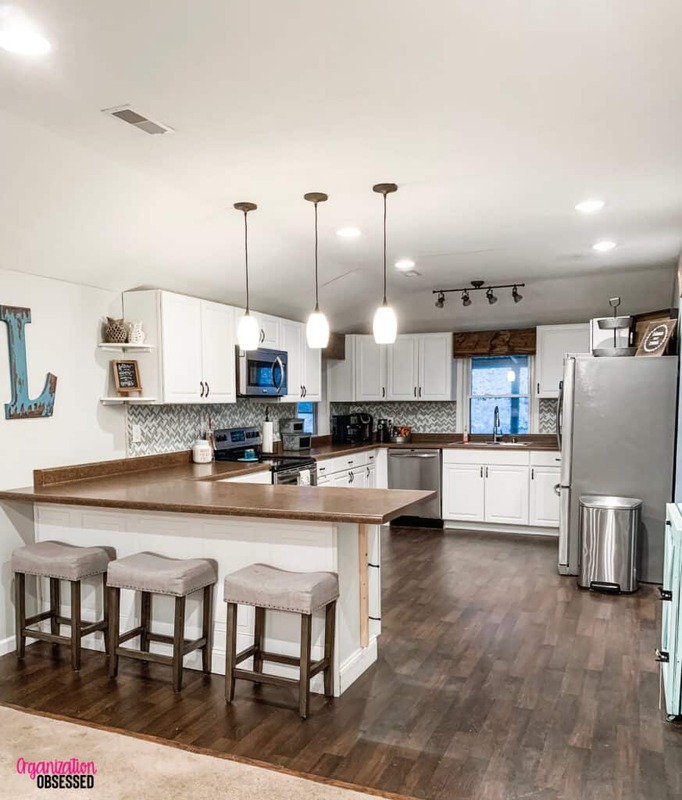 We have a fairly large U-shaped kitchen with a ton of counter space! 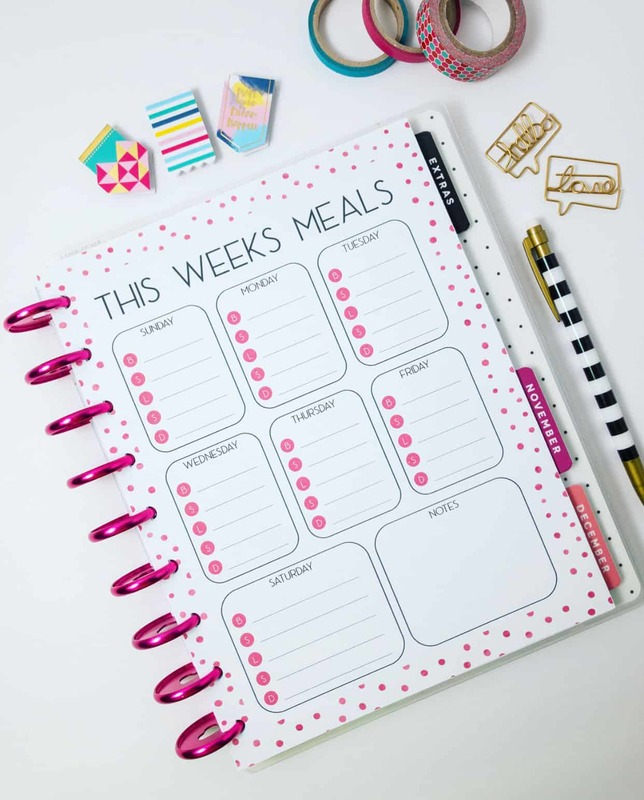 It is great for meal prep but as with any flat surface in your home, it can get cluttered super fast! I try to only keep a few things on our counters so the kitchen looks cleaner and less cluttered. For storage, we keep tumbler straws and lids in one of the metal storage boxes and cake decoration tools in the other metal storage box. In the corner, we have quite a few coffee makers. I like to tell people my husband is my barista. He is a coffee addict and we keep a lot of coffee and creamers on hand. To keep it all organized and tidy, we keep our coffee creamers and flavoring in a metal basket. When designing our kitchen when we remodelled our house, we were really indecisive about putting a cabinet over the refrigerator. In the end, we decided not to since it would just barely fit and I am so glad we didn’t. Instead, I keep our farmhouse breakfast tray, metal tiered stand and wooden sign on top of our fridge. 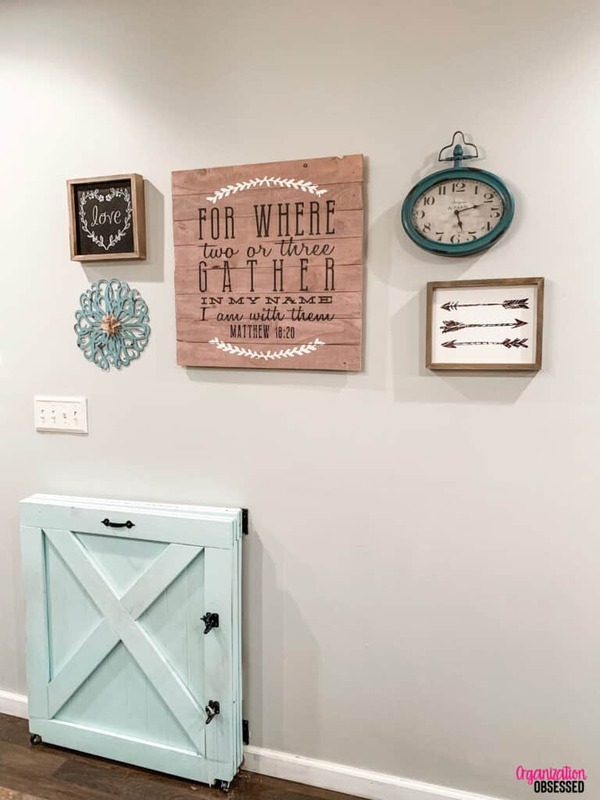 It ties in perfectly with our farmhouse gallery wall. In our kitchen cabinets, I try to keep it to a minimum and only store the things we use frequently. Our 16 glass place settings have been condensed down to only 4 square and 4 round and we use plastic plates most days. We also keep our toaster in our cabinet to keep our countertops clutter free. The top shelf has plates and bowl that we almost never use, but I keep them on hand just in case we ever need them. 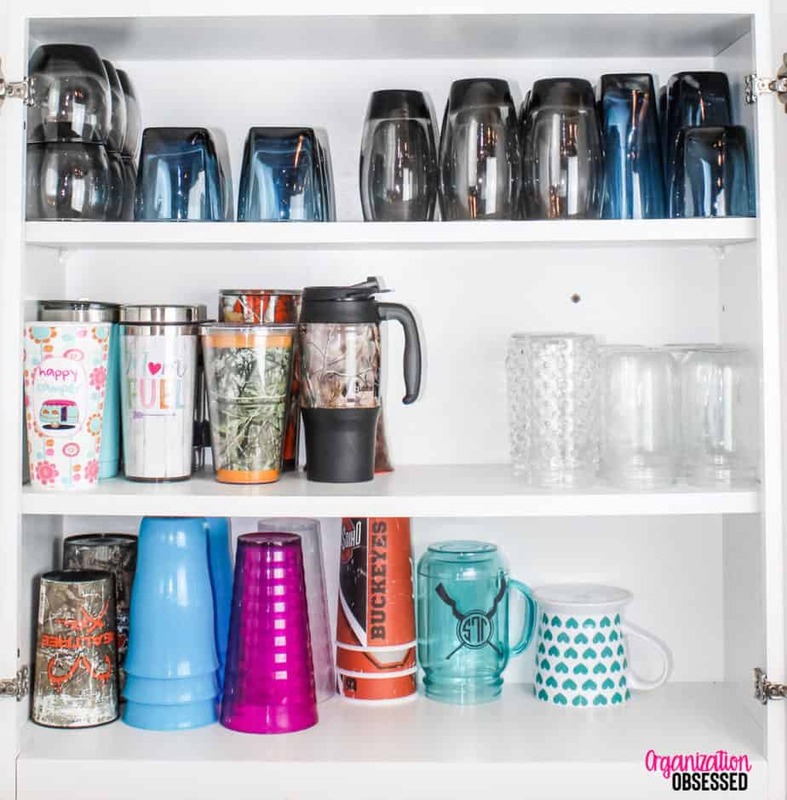 In our cups and glasses cabinet, we keep the drinking glasses that we never use on the top shelf and our daily use glasses and cups on the lower shelves. Our spice cabinet is over the microwave and we keep our spices organized by putting them in baskets. One basket contains spices we use on a regular basis. The next has spices we use some time and the last basket has spices that we almost never use. My barista of a husband loves his coffee and also loves to cook, so we have a ton of spices! Since we store the spices so high up, keeping them in baskets makes it easy to pull down a basket, get what we need and then put it back without rummaging around the cabinet for a specific spice. 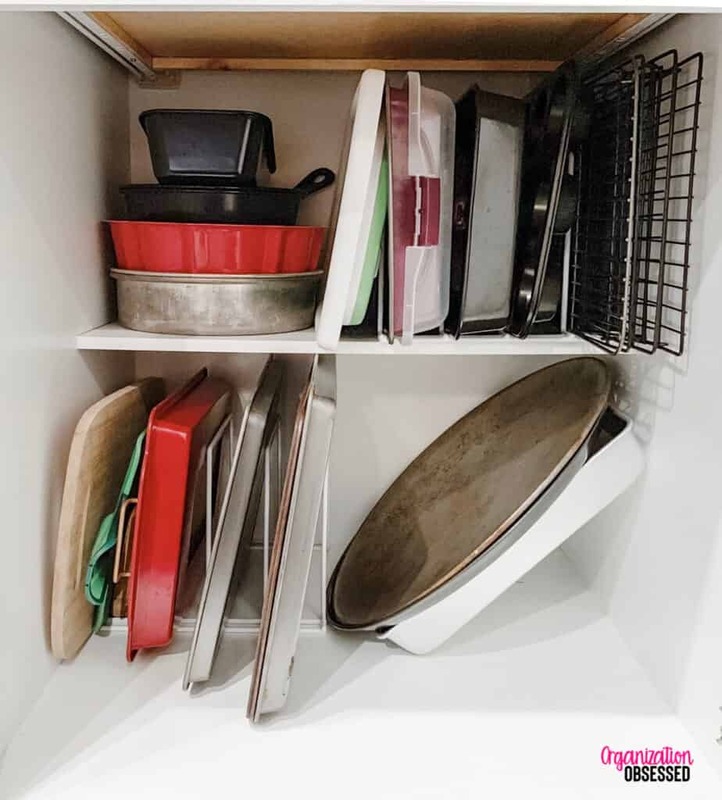 To keep our cookie sheets and baking rack cabinet organized and make it easier to put dishes away, we use this bakeware organizer from Amazon that comes in a pack of 2. They have really changed the functionality of this cabinet. We used to just stack the cookie sheets and bakeware on their sides, but they were always falling over when we would pull one out of the cabinet. Having these racks made just for organizing cookie sheets and bakeware has made it so much easier to keep this cabinet organized. 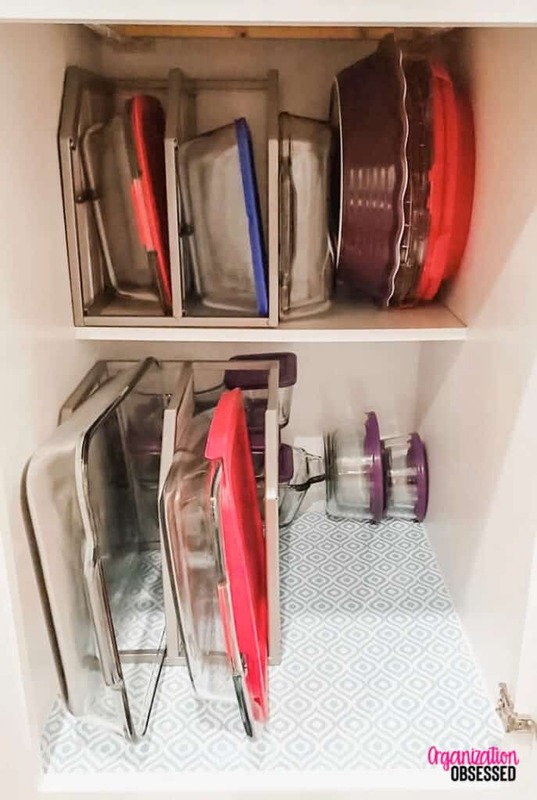 You can read more about how we stack and organize glass baking dishes here, but we use corner cabinet shelves laid on their sides to stack up our glass baking dishes. This works out so much better than just stacking them one on top of the other and makes it really easy to pull out the baking dish we need. 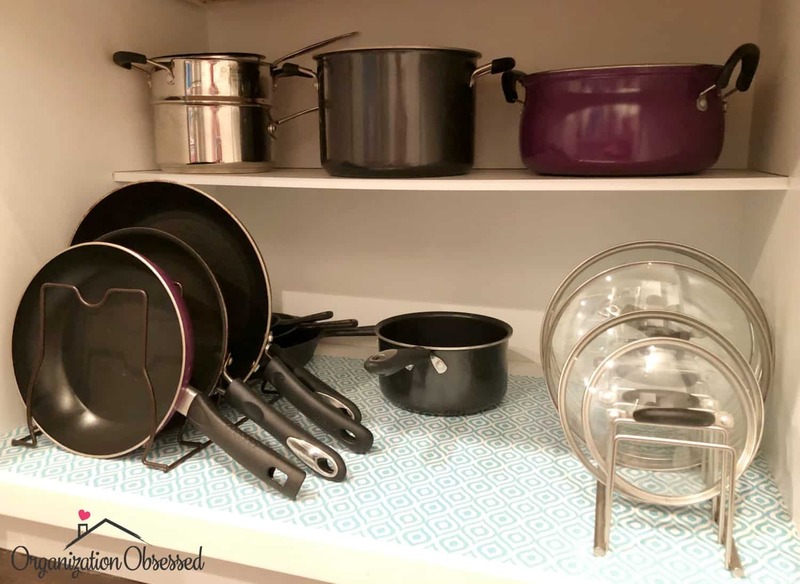 To keep our pot, pans and lids organized, we use this skillet organizer and this pot lid organizer. Before installing these organizers, we would just stack pots, pans and lids on top of each other. It was not working! Our skillets were being damaged by each other, it was hard to get out the pot or pan we needed without moving all the rest and the glass lids were always sliding everywhere. 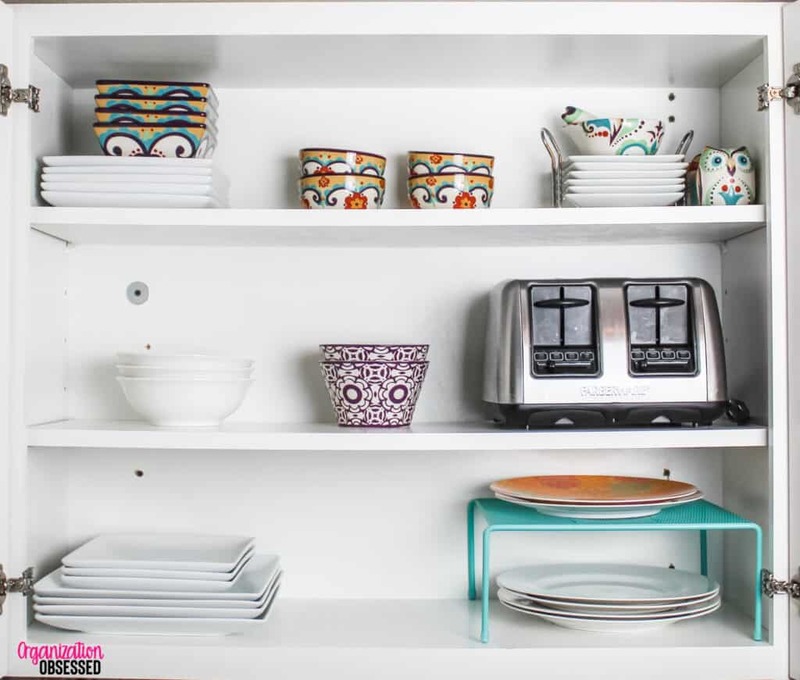 Now, this cabinet it always organized and it is so easy to put pots and pans back away after using them. 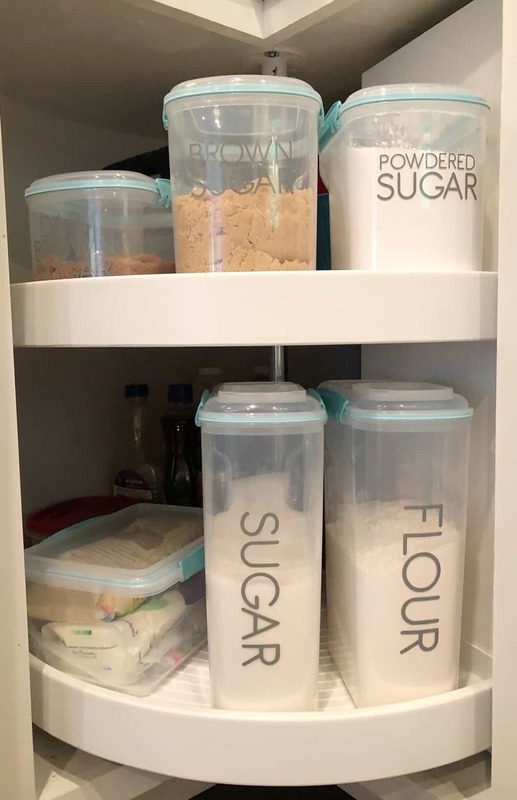 We don’t have a pantry in our kitchen, unfortunately, so we use our lazy susan to store dry goods like sugar and flour. We use Sistema Containers to keep everything organized and transferring our food to airtight containers helps it stay fresh longer! I love these containers and highly recommend them! We also use them for cereal, oats, and cookies. Most people keep their knives on the countertop but since having kids, we have found it is a lot safer to keep them in a drawer next to our oven. We use this knife organizer to keep them safely stored. 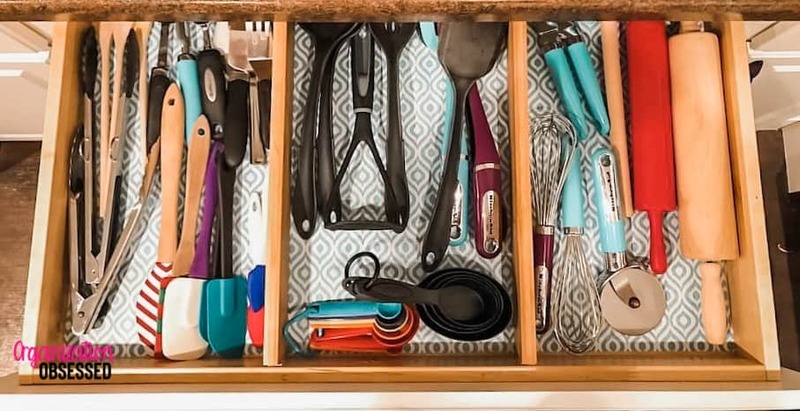 It doesn’t hold as many knives as I would like because of the way our knives are curved, but it is still great to keep our knives safe and organized! 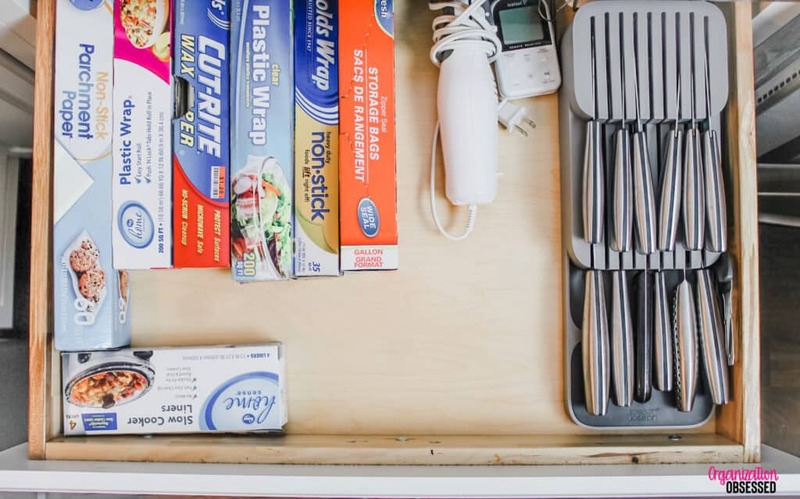 We also keep our wax paper, foil, baggies and electric knife in this drawer! We also store our cooking utensils in a drawer. This is the largest drawer in our kitchen so we use bamboo drawer dividers to keep things separated and from moving around too much. For our junk drawer, we use a junk drawer organizer. 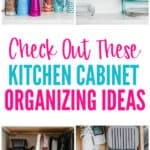 This drawer organizer is seriously one of my favorite organizers in our kitchen. My junk drawer used to be a disaster and was rarely organized. 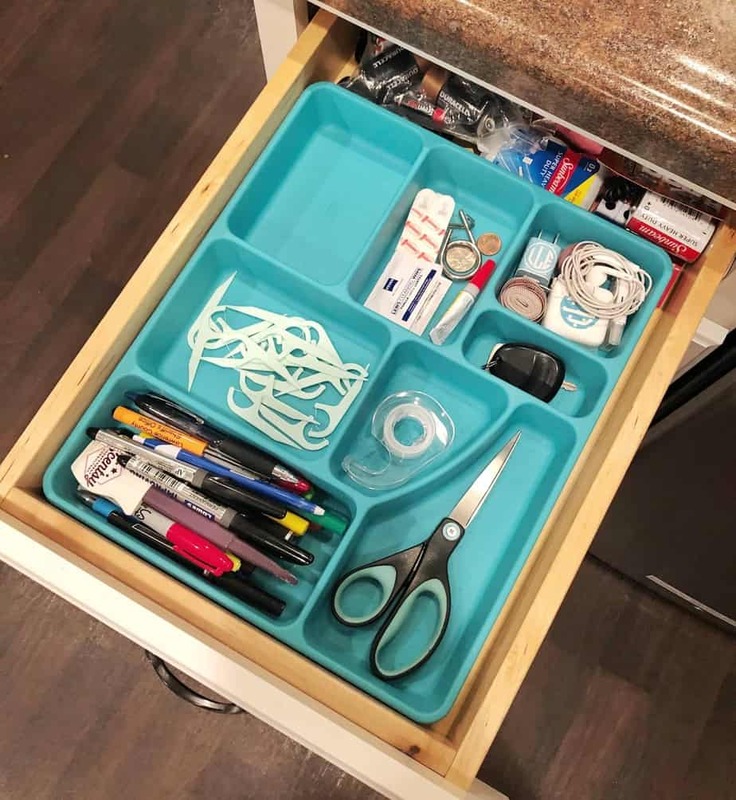 Now that we have the drawer organizer, it is much easier to keep it organized and keep “junk” from finding its way in the drawer. We keep a lot of cleaning products under our kitchen sink and for a long time, it was not organized at all. 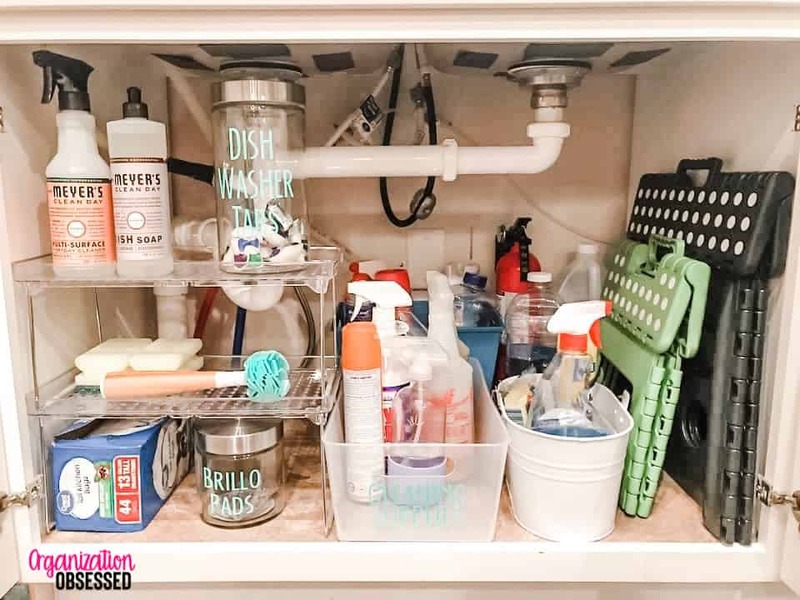 While you can read the full tutorial on how we organize under our kitchen sink here, by ditching our dollar store baskets and upgrading to a stacked shelf and a large clear basket, under the kitchen sink is a lot more organized now! You may also like these 15 genius under the sink organization ideas! 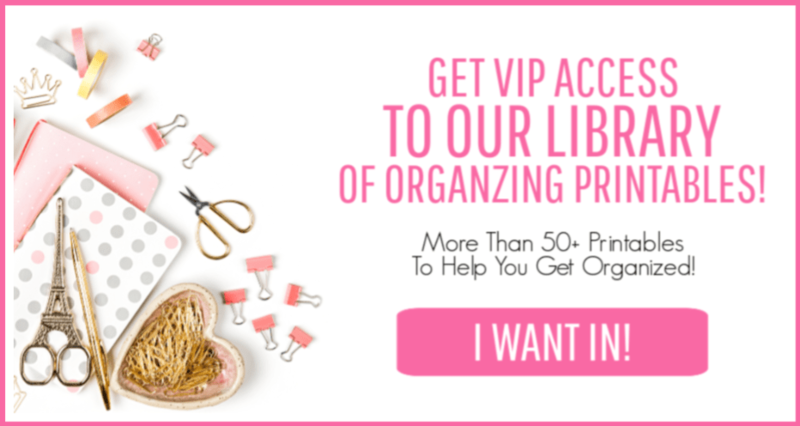 Invest in organizers to help you. 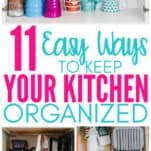 Keeping your kitchen organized is so much easier when you have the tools to help you. 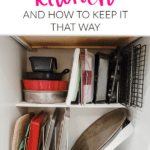 Investing in drawer dividers, pots and pan organizers and cabinet organizers will help you keep your kitchen organized longer and make it easier to find what you need. 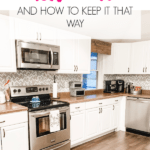 I know this is a hard one, but keeping your kitchen organized and clean is so much easier when your kitchen countertop isn’t a dumping ground. 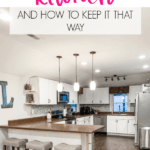 Keep it from happening by creating zones in your home for paperwork and mail, purses and backpacks, and other clutter that tends to land on your countertops. 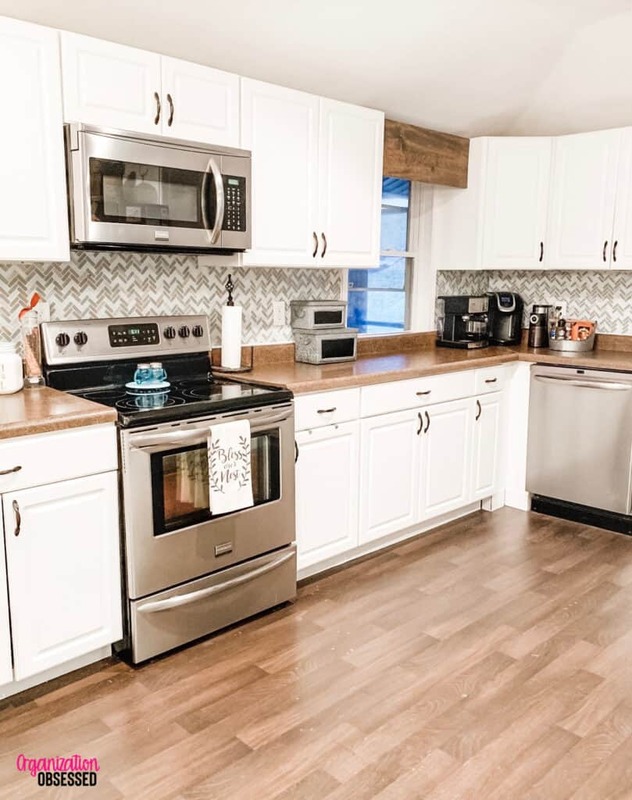 Keeping your kitchen organized and clean will be a lot easier when you make it a habit to wipe down your countertops, stove and sink every single evening. You’ll be ending the day with a clean kitchen and be creating habits to keep your countertops clutter free. 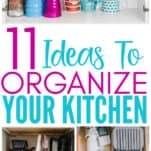 Comment below and let me know your favorite ways to organize your kitchen! Thank you. 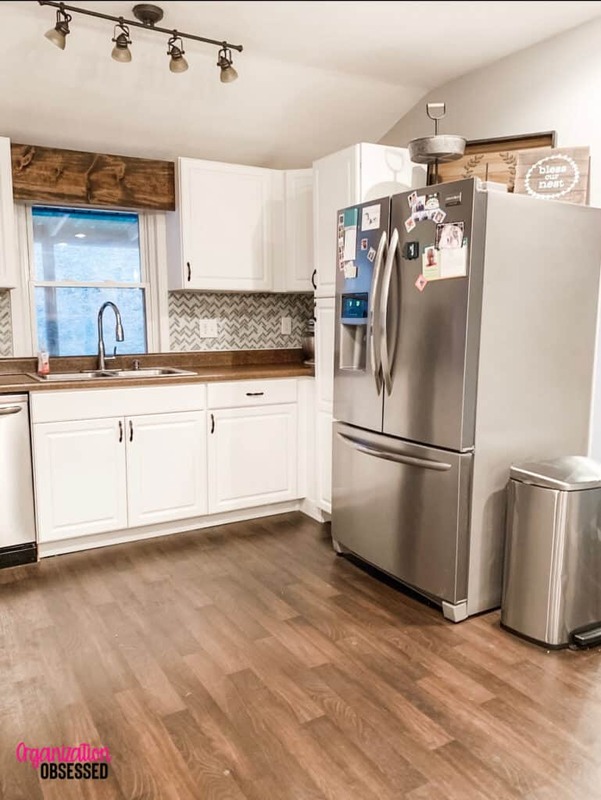 Your kitchen looks lovely.